SAN JOSE — SJ Beerwalk is back for Round 2 on Saturday, April 28, from 1 to 5 p.m. Whether you attended the first, sold-out Beerwalk in February or missed out on all the fun, the upcoming SJ Beerwalk in Japantown should not be missed. Minutes from Downtown San Jose sits the charming Japantown business district. Stoll the streets and discover all the unique boutique shops, art studios, and great restaurants you cannot find anywhere else in San Jose — all while sipping on great beers and enjoying the social enthusiasm of shopkeepers and beer lovers alike. SJ Beerwalk was created around more than the idea of sampling great beers, but rather to provide the outlet to come together to explore the neighborhoods and small businesses that help make San Jose the great city it is today. Bigger. More local craft beers with IPA offerings like Firehouse, Rock Bottom, Strike, Faultline, and Campbell Brewing. More participating businesses and pourers to thin out and speed up lines and fill your glasses faster. Better. Consistent pours to ensure everyone experiences every beer. More registration locations with full bars and ticket scanning to speed up the check-in process and provide drinks before, during, and after the event. More bathrooms throughout the walk for your convenience. Bolder. IPA-themed, the majority of the beers will be IPAs with a few Japantown favorites, such as Kirin, Napoli, and Primo mixed in. 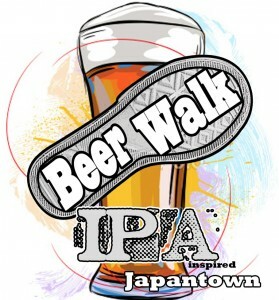 Tickets can be purchased in advance for $30 at Jack’s Bar & Lounge or online at www.sjbeerwalk.com. In the case the event does not sell out, tickets can be purchased day of for $36. Registration begins at noon. Raffle held at 5:20 p.m.
For more information, visit the website or visit SJ Beerwalk on Facebook. To benefit the Japantown Business Association (JBA) and Japan relief through Iwaki-Hisanohama Hanabi Taikai 2012 (http://hisanohama.wordpress.com). Minimum age: 21. Event is rain or shine. All tastings are 3 ounces. Only one tasting per each style of beer. Drinks must be consumed inside the tasting locations. Organizers do not guarantee that everyone will make it to every tasting location, and reserve the right to refuse service to anyone. Drink responsibly.